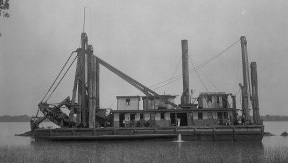 In the early 1900’s, the Illinois was the largest hydraulic dredge on Lake Michigan, sunk in 1907 in a storm when she was working as a tug and sand dredge. In 2000, the Holly, a barge was sunk intentionally nearby as a part of an artificial reef program by the City of Chicago. Sunk completely intact, it is possible for properly trained and equipped divers to penetrate the wreck and explore the interior. Additionally, the site is also occupied by general wreckage that is great for exploring and just “poking around”. Often said to have an eerie feel at night, the site is oddly devoid of seaweed or other forms of sealife. Currently, the Illinois and Holly Barges rest at 35 feet of depth, making it the perfect site for new divers and training dives. We visit the Illinois and Holly Barges from Hammond Marina.